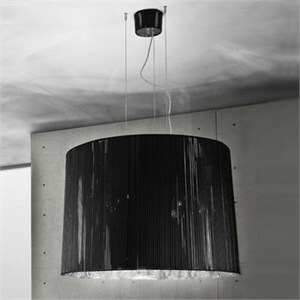 Pendant light for ambient, direct/indirect illumination. Ivory, black, white, or tobacco silken ribbons are wrapped around the frame to form the shade of the Obi. The shade is then lined with a semi-reflective PVC chrome liner. The liner reflects and diffuses the light. The canopy has polished chrome fittings as well as silken ribbon detail. Please note this product is being discontinued and is available until stock runs out.